It isn’t often I anticipate a movie, but if the 2013 version of The Secret Life of Walter Mitty is as good as its trailer, I can’t wait to see it! From what I can tell, this version is loosely based on both James Thurber’s short story and the 1947 movie, starring Danny Kaye, both of which are classics in their own right. I grew up on the film version of Walter Mitty. 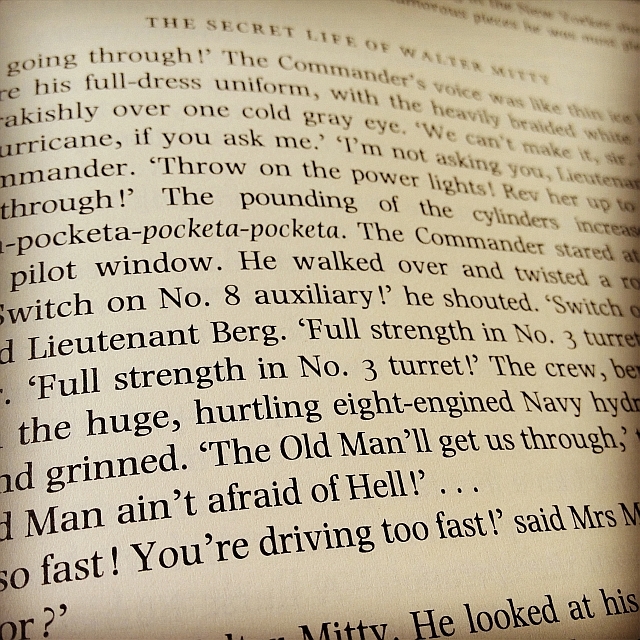 But I’d never read the short story until last year, when I bought a book called The Oxford Book of Humorous Prose (which is, as its title states, a huge collection of humorous prose from the last 500 years, focusing mainly on the last two centuries) which included The Secret Life of Walter Mitty. Since it was only a few pages long, I decided to read it then and there. It was a quick read, and I enjoyed it, but I was constantly comparing it to the movie and felt slightly let down because it seemed to be “missing” over half the plot. With this new version of Walter Mitty coming out, I think a lot of people will be comparing it to the Danny Kaye film. I was interested to know what James Thurber thought of the 1947 film (since it was so different from his short story), so I did some reading up on it and wasn’t too surprised to find that he was entirely unhappy with the film. The writing of the screen play and story line were done by others and he was brought on for collaboration right before shooting was to start. He hated it. It was far too melodramatic for his tastes, but there was nothing he could do about it. I’m not usually one to side with the movie makers over the author, but in this case, I’m glad James Thurber didn’t get his way. If he had, this scene, for example, would only be the first twenty-five seconds and we would’ve missed out on, what James Thurber referred to as “Danny Kaye’s git-gat-gittle and appalling songs in gibberish,” but what I see as Danny Kaye in all his glory giving us a hilarious and brilliant performance only he could pull off. The genius of Walter Mitty is that you can give him a new plot or put him in a different universe or time frame and he will still essentially be Walter Mitty. The original short story and the 1947 film each gave us something different, but to me, they’re both perfect in their own way.